The original Lamzac by Fatboy is now available in a large version so that you can can relax together with a loved one in the park, at the beach, at festivals or in the garden. Thanks to unique technology, Lamzac is filled with air in a matter of seconds creating a soft air cushion on which hours can be spent relaxing. One end is slightly elevated to ensure maximum comfort for the head. When the Lamzac is no longer needed, the air is let out by simply rolling it up. A carrier bag is provided to store the air sofa in a space-saving way. The portable air sofa can be taken along wherever you go and is the perfect companion for all outdoor activities. You are sure to attract attention when using the innovative inflatable sofa in public! 3. Roll up the end and secure with the clips. 4. Put the Lamzac down with the logo facing up. 5. Done! Lie down and relax. The Lamzac L by Fatboy can hold up to 200kg and is suitable for two adults. 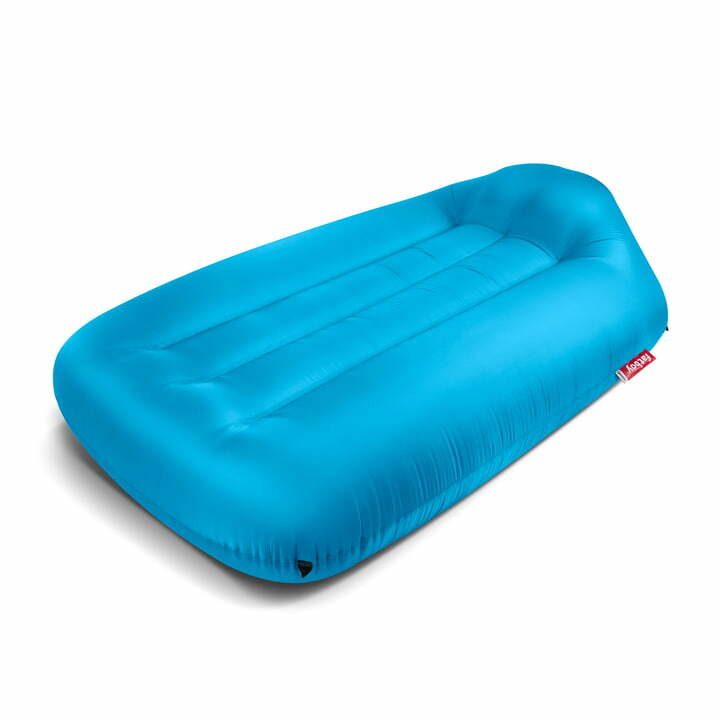 Isolated product image of the Fatboy - Lamzac L, aqua-blue. One end is slightly elevated acting as a built-in cushion to ensure maximum comfort for the head.